It is finally here, my boyhood dreams from fifty plus years ago have been fulfilled. We have a real wargame with plastic toy soldiers. Yes, there have been a few attempts before with this formula, but none have succeeded as well in my eyes as 'Hold The Line'. 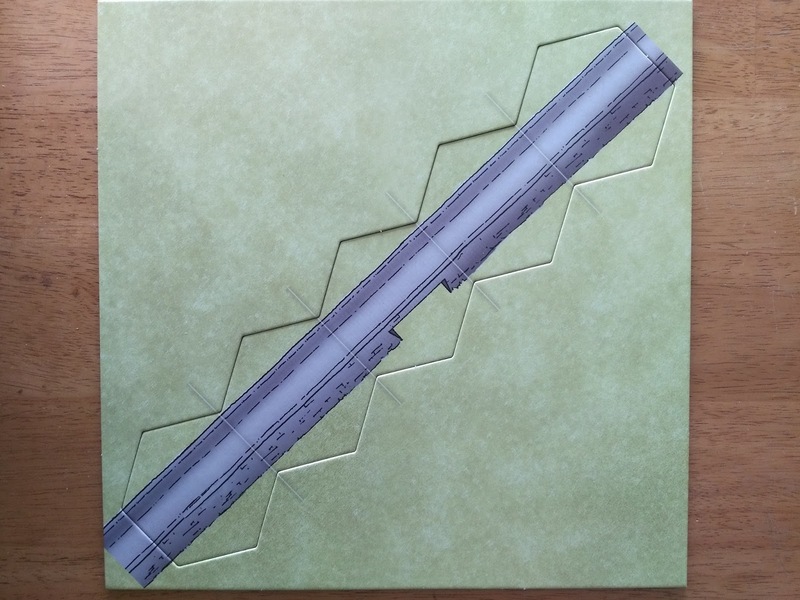 The maps is 21.5" by 34.5" across. 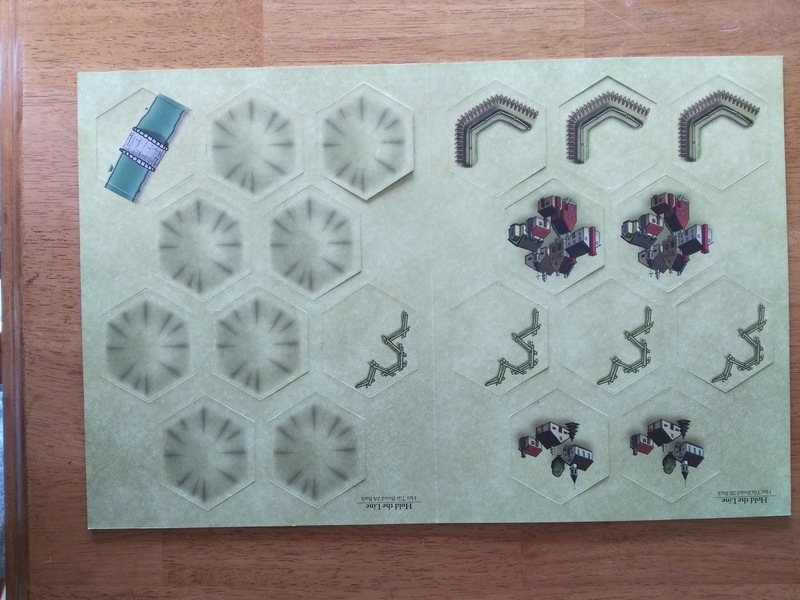 It is a plain map, but the game comes with a ton of geomorphic hex tiles to represent pretty much any battle of the era. I like the artwork on the geomorphic hexes. To some they might seem plain, but to me they fit the period, and are highly functional. Yes, these are plastic soldiers. So there will be some bayonets or flag standards that droop or bend the wrong way. As has been written, you can fix this by immersing them in hot water if you choose to. 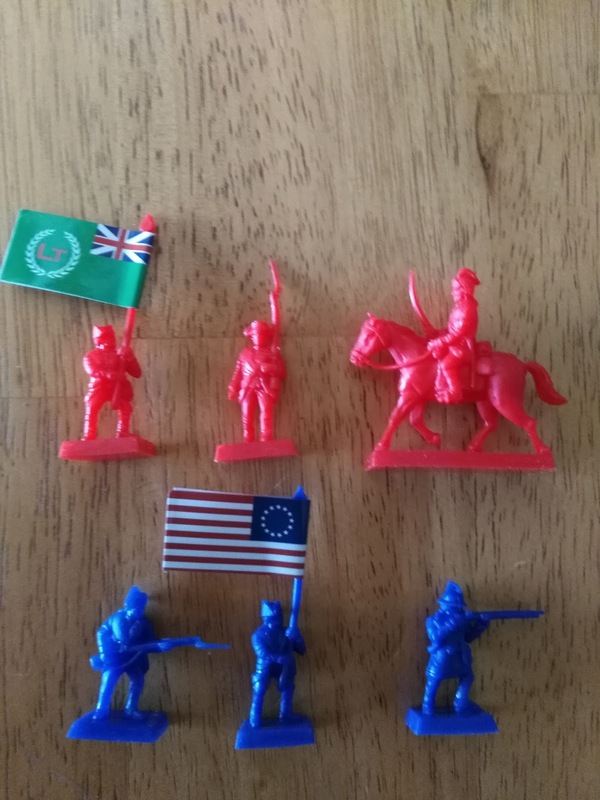 These were not, and are not, supposed to be fancy miniature toy soldiers. If they were, very few of us would be able to afford the game. These are the same plastic soldiers we played with fifty years ago. These soldiers work fine with the game, in my mind. As you will see in the pictures, I did not bother fixing any drooping. 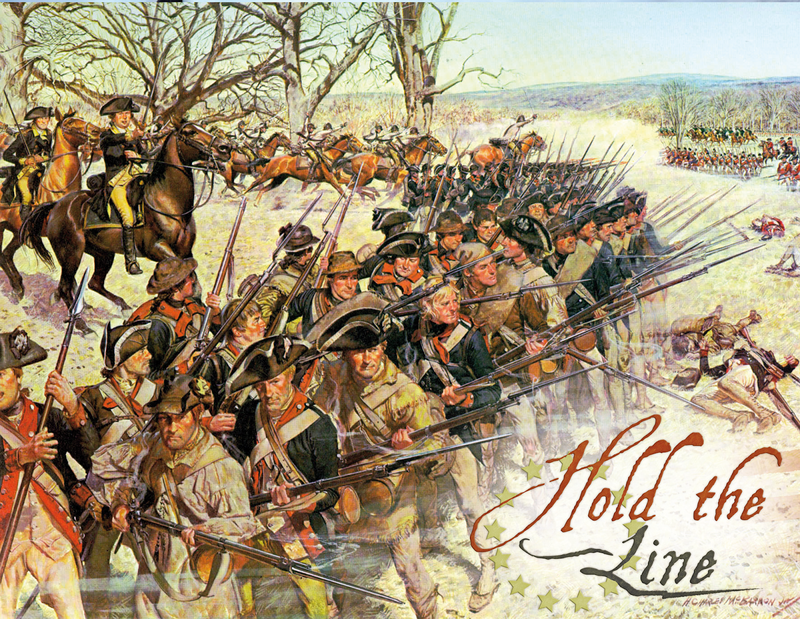 This is a remastered edition of the 'Hold The Line The American Revolution', so it comes with a whopping thirty-four scenarios. From the Minutemen to Yorktown, and from Quebec to South Carolina, and everywhere in between. These scenarios range from tiny to the largest battles of The American revolution. The rule book is twelve pages long. Instead of cards or chit pulling, the game works off 'action points'. Each side has X amount of action points listed in the scenario notes to use each turn. At the start of each player turn, the player will roll a six sided die to see how many more points he will have to use. Every action of the player costs action points. Units move by the expenditure of one AP. As long as a leader is with a unit that is activated, the leader can move with the unit for no cost of APs. Infantry and dragoons accompanied by a leader can move one extra hex, for the cost of one AP. Fire combat costs one AP, and close combat costs two APs. Player A performs his actions, movement, fire, etc. 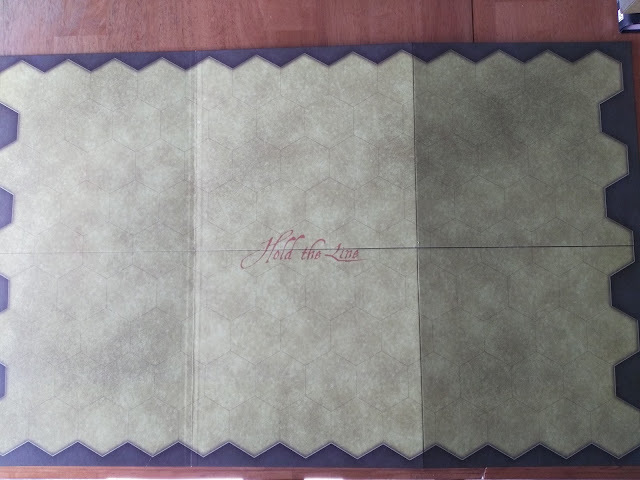 The line of sight rules are straight forward, and easy to understand. If something is in the way, there is no line of sight. 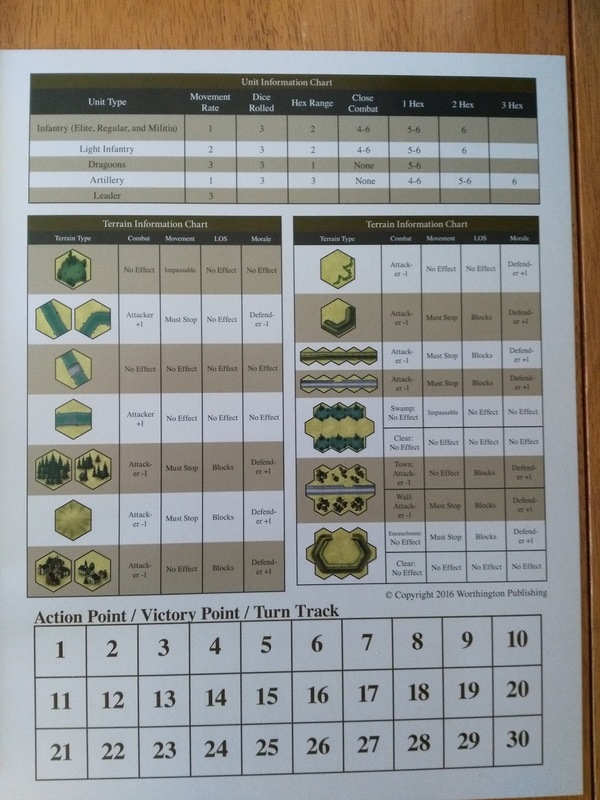 There are rules for the Leaders to be able to rally troops, and the game also comes with some advanced/optional rules to enhance play. The player has the ability to play a campaign. 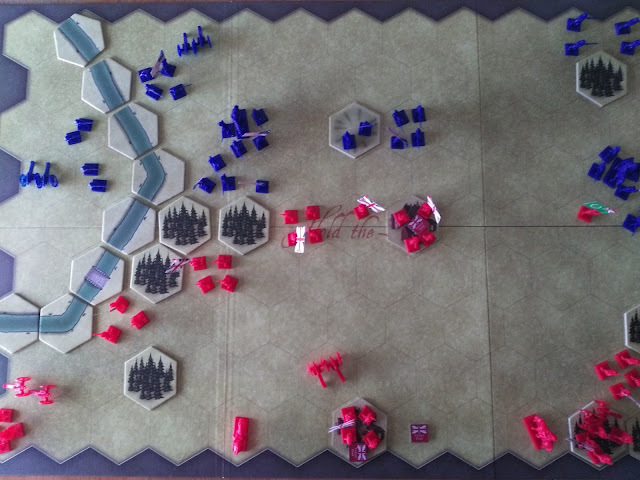 These are linked scenarios, with as little as two battles, the largest being four battles. One thing that has caused some players a problem is the amount of die to roll if a unit has sustained casualties. It is always three die no matter how many pieces the unit is missing. Most infantry start the game with four pieces per unit. The missing pieces represent mostly morale loss by the unit. The following will be some pics of my Battle of Germantown playthrough. The game plays much faster than I expected. 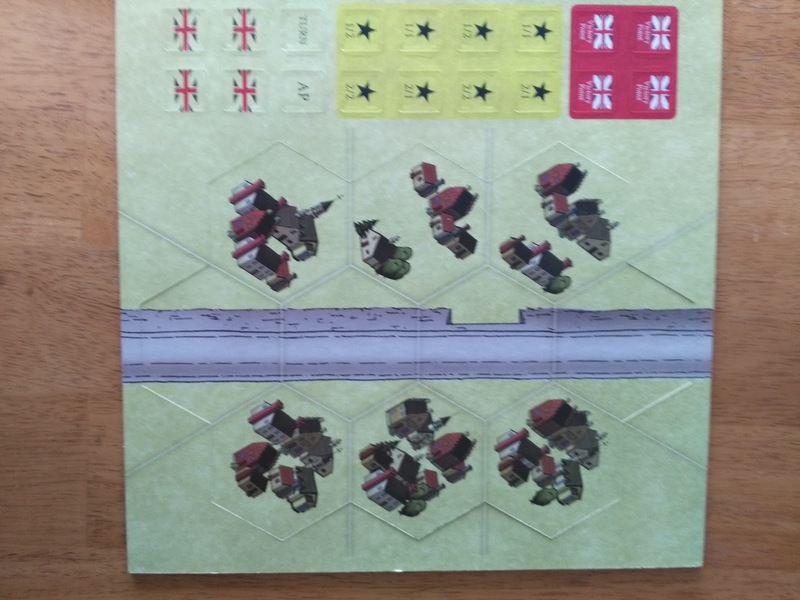 The regular infantry, which is usually most of each force, only moves one hex per turn, unless you have a leader present or are using the optional forced march rule. This, along with the low action points that each side has, made me think that it would be a few turns before the mayhem began. While the first turn was just movement on both sides' part, after that the the combat came fast and furious. The British were racking up a lot of Patriot morale losses with their die rolls, and it looked to be an easy victory for them. However, the next two turns the tables completely turned, and it was the Patriots who were rolling high numbers and causing large damage to the British units' morale. Here is the action on turn eight. The morale/unit losses are about equal right now. The Hold The Line French & Indian War expansion set/add on comes with four sheets (two front and back) of added geomorphic hexes. 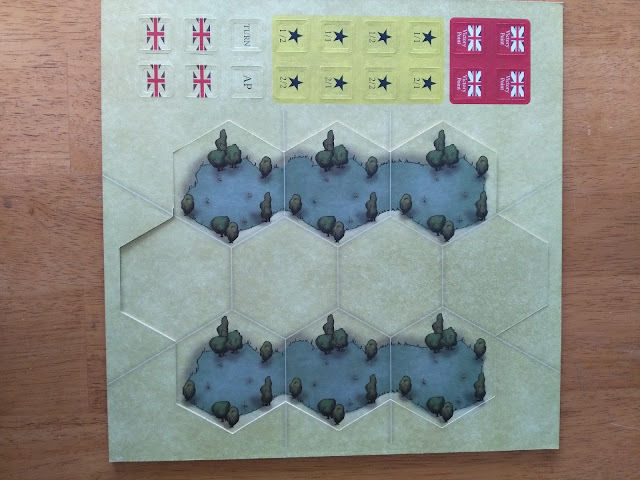 The new tiles include boats and deep water hexes for playing out amphibious operations. 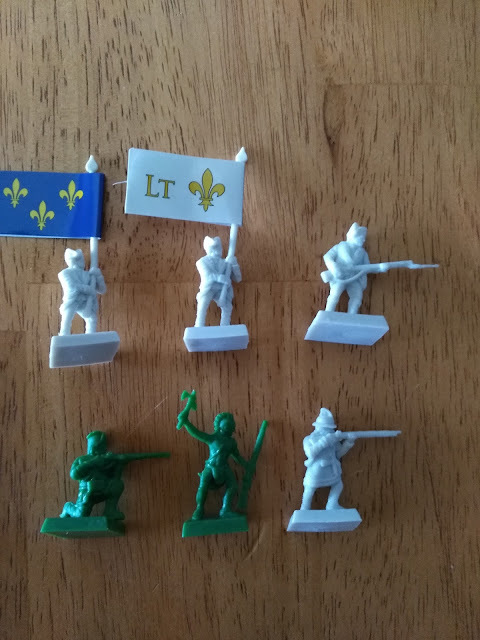 The expansion set comes with, now wait for it, French and Indian plastic soldiers, but also includes green ranger soldiers. The French & Indian War expansion gives the player another thirteen scenarios to play. That means with both the base game and add on you get forty-seven scenarios. Most of the new scenarios are naturally during the French & Indian War, but you also get two from Pontiac's rebellion and another two from the American Revolution. I like the game and can easily recommend it to other gamers. 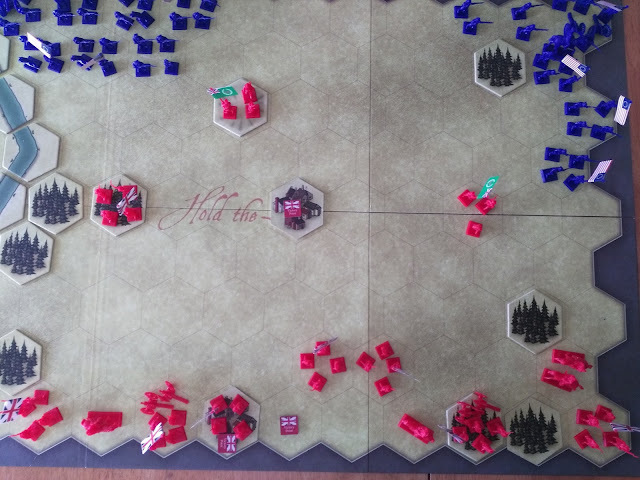 The rules are easy to understand, and the game gives a good representation on the warfare of the American Revolution. The only rule I do not like is that dragoons cannot initiate close combat. I understand why the rule is in place. I just think that Banastre Tarleton would have an objection to it. With so many scenarios available, and the absolutely unlimited option to play out any scenario you can dream up, the game and its expansion set are worth every penny. Worthington Publishing also has Hessian and Highlander plastic soldiers for sale to add some historical flavor.